I was catching up with a friend a few weeks ago and while we live in the same town we hadn’t seen each other in quite some time. She told me that she was going to be in New Orleans on business for a few days and without much hesitation, I invited myself on the trip. 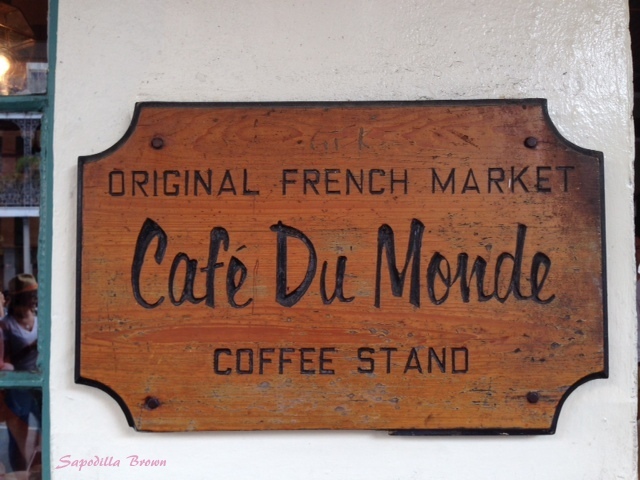 We all know that New Orleans is an awesome place to get some grub and with both of us being foodies we quickly mapped out our food tour for the few days that we were in town and boy did we EAT and EAT and EAT!!! As a result, the next two blog posts will be about some (we could not make it to all) of the good eats in and around NOLA. Our first stop was in the 7th ward. 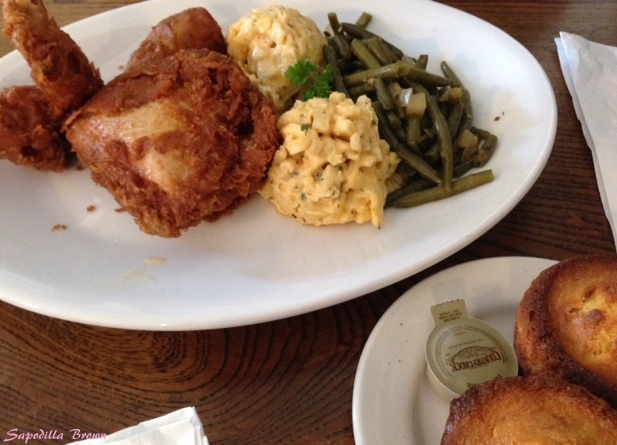 We had heard great things about this local joint called Willie Mae’s. Open for only seven hours a day Monday through Saturday from 10:00 am to 5:00 pm. 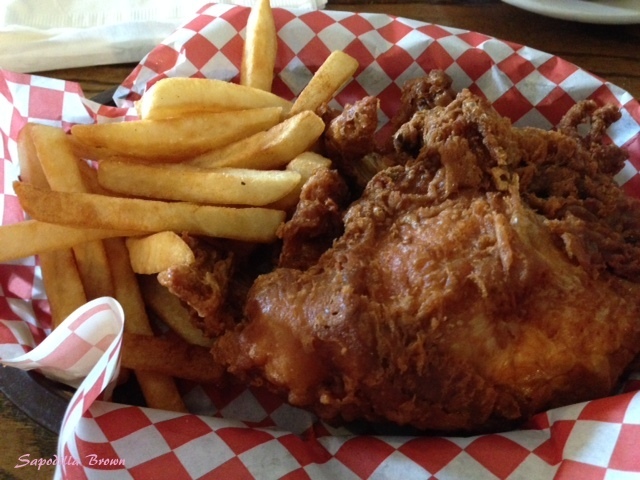 Willie Mae’s is known for making the best and I repeat, the best fried chicken in the country! Now I haven’t had every single bit of fried chicken in all of the United States but I will say the fried chicken at Willie Mae’s definitely lives up to the hype! 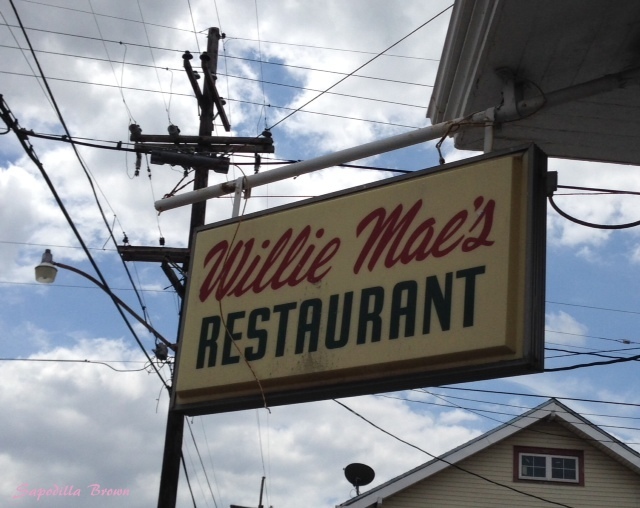 Before we arrived at Willie Mae’s we were a tad concerned that there was going to be a long line and we would have to wait quite a while to be seated and served. They don’t take reservations and we were hungry. We got there around 2:00 pm and as our luck would have it, our wait was no more than 15 minutes. The establishment is small so they actually ask patrons to wait outside until a table is ready. Everything tasted great! Hands down, the chicken was definitely the best fried chicken that I have ever had! It is made to order and came out crispy on the outside, moist on the inside and not too greasy. Now my friend and I happen to also share the same enthusiasm for good bread pudding. 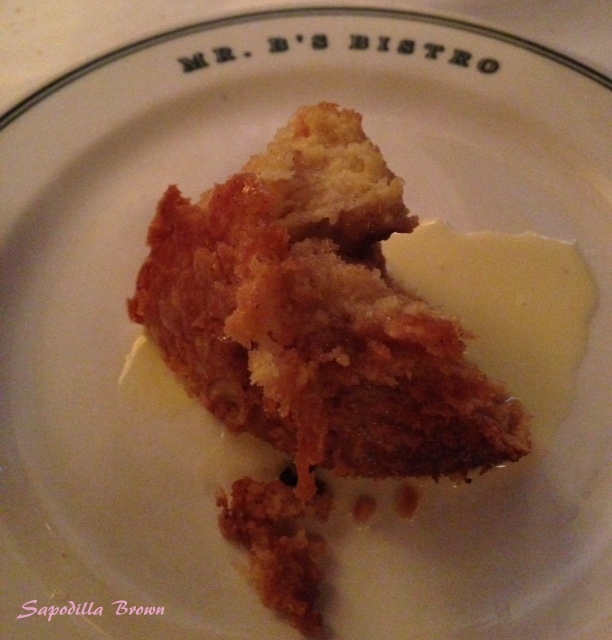 So, we decided that we would try the bread pudding at each of the restaurants we dined at and rate them. We did just that! When our handsome waiter asked about dessert, we did not hesitate in placing an order for bread pudding. Here is what we got! I will give you the final assessment later. All in all I highly recommend the fried chicken at Willie Mae’s. It’s definitely worth the trek to the 7th Ward. With bellies full and appetites satiated we left Willie Mae’s and made our way to the French Quarter to partake of the festivities that they had to offer. After wandering through the streets of the French Quarter enjoying the art, random street performances, stores and happy people (the drinks start flowing pretty early, we even had a store entice us with free daiquiri’s) , we made our way to Mr. B’s. Bistro. Now our initial plan was to have appetizers at Mr. B’s and head somewhere else for dinner. That of course quickly changed when we got there and scanned the menu. We ordered the barbecued shrimp. The shrimp come with the shells on and are served with a peppery butter sauce. No knife and fork here, you definitely need to use your hands to remove the shells, dip the shrimp into the sauce before your taste buds happily do an “I’m feelin’good” dance! 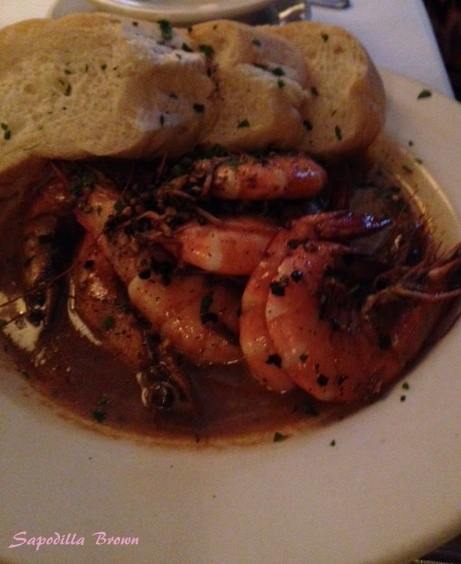 The BBQ shrimp also comes with some nice warm French bread to sop up any remaining sauce. We also ordered shrimp and grits. Now I am not a huge fan of grits but I was being open. Hands down, these were the best grits that I had ever had! Super, creamy! 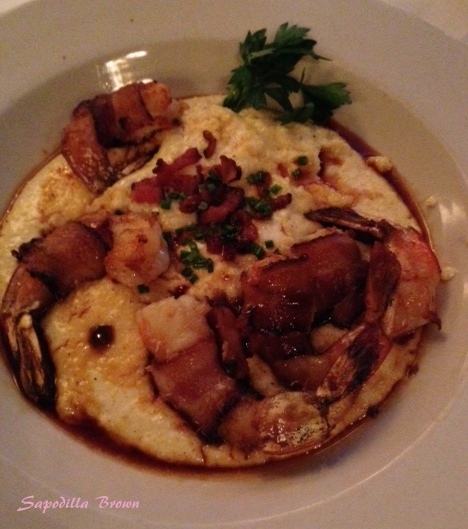 The shrimp was wrapped with pecan smoked bacon and the grits topped with a red-eye gravy. The food was awesome! My mouth is watering as I think about it. Ummm yeah, see what had happened was, we liked it so much sharing just one was not enough. We had to order a second (not sure why the waiter did not take us seriously the first time we asked him for a second serving lol). I will announce our favorite at the end. 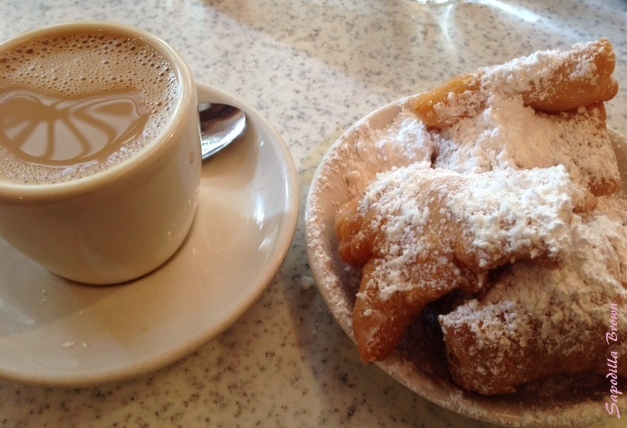 We made it a point to stop by Café du Monde every day of our trip. Can you blame us? Stay tuned for part two of this trip. The post will be up next wee. Thanks for stopping by. Don’t forget to leave a comment, like the page on facebook or follow on twitter and instagram!